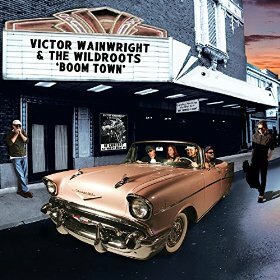 I just received the newest release, Boom Town from Victor Wainwright and the WildRoots and he just keeps getting better! Opening with title track, Boom Town, a cocky strut, Wainright leads the way on piano and vocals. He not only has a great voice and acclaimed piano skills but a focused ability to take you places with his lyrics. Excellent! Rock and Roller, Saturday Night Sunday Morning really kicks up the dust and Billy Dean on drums, Stephen Dees on bass and Ray Guiser, Patricia Ann Dees and Charlie DeChant on sax hold tight as Wainwright hammers the white right off of the keys. What a rocker! Boss rocker, Stop Bossin' Me Baby stays in the rockin' beat and really kicks. Wainwright is known as one of the best boogie piano players of today's generation and with his solid vocals he's likely to stay on top for a long time. Stephen Dees and Nick Black lay down some hot guitar riffs on this track pushing Wainwright to keep it hot...not a problem! Funky, New Orleans flavored, If It Ain't Got Soul - Pt. 1, has a smokey flavor with Stephen Kampa on harp and Wainwright and Black on vocal. Laying out some hot Hammond on this track, Wainwright adds to the funk for one of the best tracks on the release. When The Days Is Done has a field revival sound with really nicely blended vocals of Wainwright, Dees, Black and Beth McKee. Really strong! Genuine Southern Hospitality gets that "Little Feat" funk going with some really nice slide work from Ernie Lancaster. Wainwright may be known mostly for his excellent piano work, but his vocals are so superb that he could front most any blues band. Two Lane Blacktop Revisited is a great rockin' piano boogie. Stilladog, this track has your name written all over it! Taking the tempo way down, Wildroot Farm has the feel of a Dr. John track with Patricia Ann Dees trading lead vocals with Wainwright. A cool 40's style slide with Kampa taking a nice lead line on harp, another solid track. Piana's Savannah Boogie is a real rolling piano boogie and a wide open opportunity for Wainwright to establish again why he's on of the absolute top boogie players today. Excellent! JP Soars takes the lead guitar on The Devil's Bite which has an almost Django like acoustic chord part. A great story track, excellent guitar riffs and just a great groove! Reaper's On The Prowl is a cool mix of early western/surf soundtrack, a great driving rhythm guitar and over the top vocals. Very cool! Shuffle track Back On Top, features Robert "Top" Thomas on guitar blended nicely with Kampa on harp. Cool Texas style guitar riffs and rolling boogie piano this track is really nice! Wrapping the release is WildRoot Rumble which is a freewheeling rocker with a hot drum ride from Dean joined by soloing harp by Kampa, cooking piano solo by Wainwright, slashing guitar soloing from Black and Dees, eventually breaking into a full on Mamba and then back to a circle of soloing and back again to a driving boogie. The release is a smokin' hot rife. Turn it up and jump on!